Would like to give some introduction! 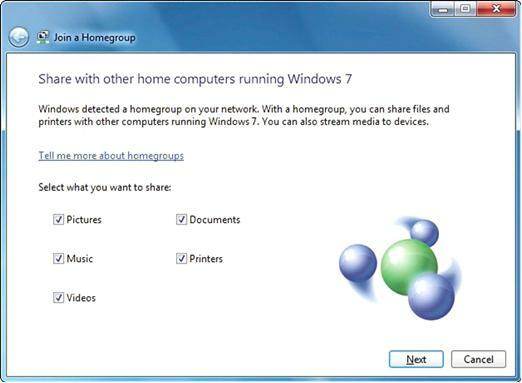 Homegroup is new feature in Windows 7 to make file, printer, picture, music, video or other documents sharing easier and faster, however only the computers running Windows 7 can join this homegroup. Furthermore, in Windows 7 Starter and Windows 7 Home Basic, you can join a homegroup, but you can’t create one, too bad. Of course you can create new homegroup if you use Windows 7 Home Premium, Professional, Ultimate, or Enterprise editions. In Windows 7, all the files, printers and media files are gathered to become libraries and to be shared via homegroup feature with password protection. In term of access control, other people cannot join homegroup and access to the shared files unless the password and permission is given. If your computer belongs to a domain, you can join a homegroup but you can't create one. You can access files and resources on other homegroup computers, but you can't share your own files and resources with the homegroup. How about accessing shared files from other version of Windows, such as Windows Vista or XP? Can it be done? Yes, the shared resources on Windows 7 can still be accessed from other versions of Windows with visibility to the shared folder/files directly, but cannot view libraries or homegroup. Please note Windows 7 lets you establish three types of networks, which are Home, Work, and Public, and a homegroup can exist only if the networks on all your computers are set to Home. Once the homegroup is created, you can manipulate the file to be shared, who can access the file, can the file to be changed, set read only access on certain files, etc. If you are interested, let's check out here to create homegroup in Windows 7. Return to top of "Homegroup – Sharing Files Easier in Windows 7"! !